Opinion: With friends like these, who needs enemies? For those from further afield than my own backyard let me set the scene; for many years Sydney Design had been Sydney’s one and only effort to recognise, celebrate and promote Design to the good people of Sydney – Design in it’s many guises, product, interior, architecture, urban and of course a bit of graphic design now and then too. 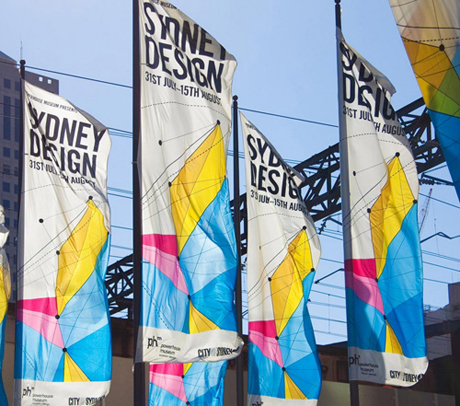 An initiative of the Powerhouse Museum, and originally titled ‘Sydney Design Week’, over the years the festival morphed into a longer and more complete program of events – thus dropping ‘Week’ from it’s title. Each year, I looked forward to seeing the campaign concept and marketing for the festival appear – who won the job? Who was on the pitch? How’d it turn out? Then the appearance of the program and the events – from symposia, workshops, films, exhibitions and talks – another source of anticipation and high expectations. But mostly I cared about the look and feel – I’m a graphic designer after all. And over the years it threw up some highlights – from the chicken and egg games on street posters by Boccalatte from many years ago, to the more recent efforts demonstrated above from Toko and Boccalatte again (stalwarts and acknowledged masters of working with cultural clients that they are). 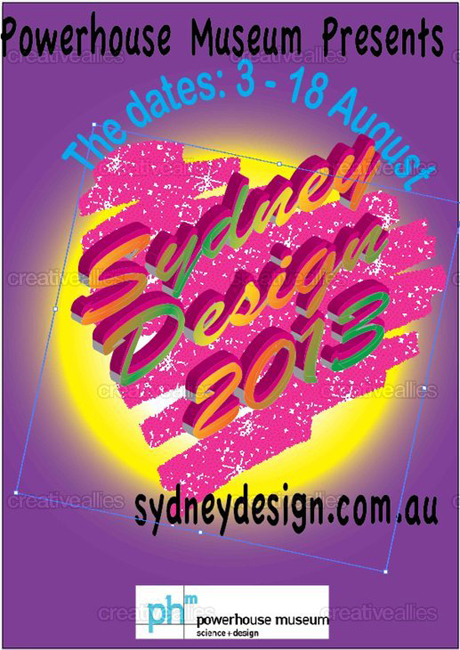 I speak of Sydney Design in the past tense because the festival I remember, used to be about Design. It used to value Design. It used to celebrate, promote and champion it. 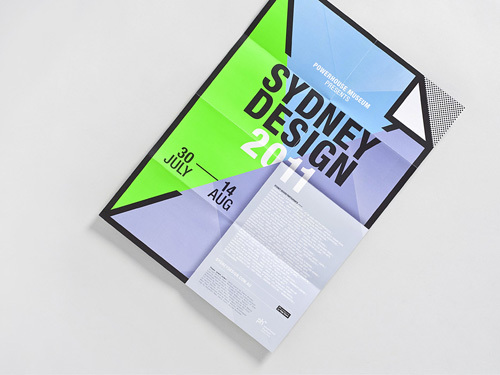 In 2012, Sydney Design took a year off, with the reasoning being vaguely attributed to budget cuts (presumably the organisers would blame the newly elected Liberal state government and their budget balancing ways). Over the one year break and the near death experience, Sydney Design seems to have changed, and not for the better. For 2013, Sydney Design have decided to embrace an open competition (translation, crowdsource) to source their ‘campaign concept’, using the ironically named site, Creative Allies. It would be tempting to begin a critique of this approach by pointing out the Creative Allies site is usually for music fans to design the merch for their favourite band – but that would be too easy. A couple of disclaimers before I really roll up the sleeves and work through my thoughts on this. It’s indeed understandable that budget cuts are budget cuts, and the effects they can have on a cultural festival already stretched thin are devastating for all concerned. Also, by no means is my reaction an instinctive reflex against crowdsourcing as inherently bad for the industry, as many are fond of moaning; I have little interest in doing logos or websites for $500. However, many people need them, and designers around the world are willing to take on this type of work. Crowdsourcing sites provide an efficient mechanism to facilitate such a transaction, rather than the high maintenance ‘relationship model’ many of us in the industry prefer from our clients. If the phone in my studio rings less with clients whose budgets are measured in the hundreds, and not thousands (or tens of thousands), it’s a win for everyone as far as I’m concerned. Especially the (admittedly few and far between) designers in developing economies earning a living from working almost exclusively through these sites. 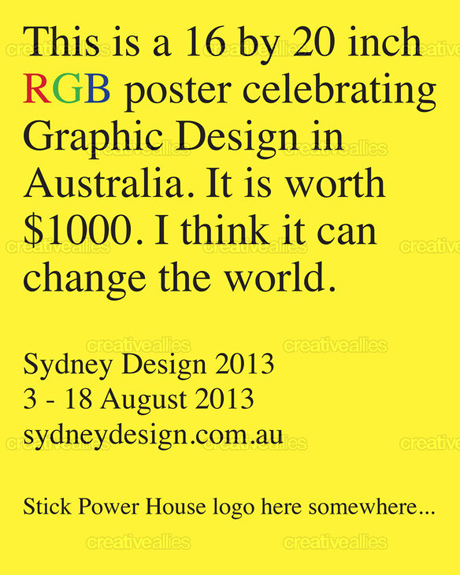 But Sydney Design isn’t a suburban dentist or a plumber looking for a spiffy logo to put on the door or truck. 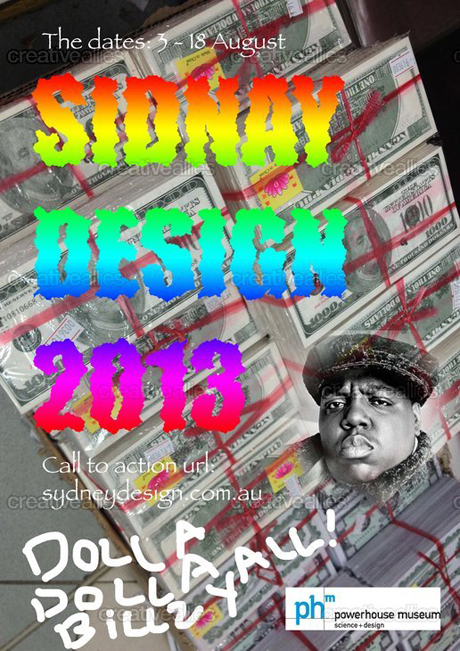 Forgive the crudeness of the expression, but Sydney Design are meant to be in our corner. A festival that is tasked with celebrating and promoting capital-D Design should know the core of great Design lies within thoughtful interrogation of a subject matter. Meaningful dialogue and collaboration are at the heart of the design process, and it can’t be achieved through posting 5 paragraphs and some tension sliders on a crowdsourcing site. Sorry, it really can’t. Small budgets have never intimidated or limited great designers – design books, museums and award annuals are filled with clever solutions to small budgets. Non profit organisations the world over have created value with, and enjoyed the benefits of, working with designers who place an importance on making a contribution and giving back to society, rather than purely chasing commercial outcomes. Sydney is alive with studios doing work of a scale, quality and significance in direct contradiction to their client’s budget. This work not only makes these organisations look good and speak with a compelling voice, thus growing their audience, but in many cases those creative partners contribute valuable strategic and business advice, making those organisations more professional, relevant and financially viable. A city’s program of cultural festivals, their visual identities and highly visible marketing campaigns are a key part of the experience it’s inhabitants and visitors have of a city. If a city is a person and the building are it’s clothes, the visual language we experience on the street are it’s jewellery – bright, shiney and attention grabbing. In my own experience working with the Sydney Biennale (way back when), the importance of the marketing campaign as another venue through which the public engages with the art, artists and themes of the biennale was discussed and explored at length. I may be biased towards the work of friends, but the vibrant, contemporary nature of the 2011 campaign by Toko was particularly memorable. The city became a gallery for one of Australia’s most progressive design studios to strut their stuff – for a short period, Sydney was an aesthetically better place to experience. I remember seeing Michael and Eva on Foster Street during their time on the project – to say their heart and soul was being poured into that project is an understatement. Sydney Design have turned their back on that relationship for the expedience of a design competition and the illusion of choice through ‘options’. Lastly, and perhaps most heartbreaking of all, for a program that is heavy on architecture, interiors, product and craft – the identity and marketing campaign was the primary vehicle by which Sydney Design celebrated graphic design. Year after year great studios did fantastic, challenging, progressive work and humbly presented it as their gift to the people of Sydney for their consideration, admiration or otherwise. If people chose to tune it out and ignore, well that was fine too. The point is, we were there, we had a forum, a vehicle. People are free to decide what they do with the efforts of designers of any stripe – that’s entirely ok. But when a publicly funded organisation (whose entire justification for their funding, and thus their existence, turns on promoting and championing Design) chooses a crowdsourcing model, it’s incredibly disappointing to say the least. But who knows, maybe a great designer like Vince Frost will enter, create something amazing and win, thus proving me wrong. Stranger things have happened. Sydney is capable of better, Sydney’s Design industry deserves better, and the people of NSW are providing funding for something better. See the current crop of entries to the competition here. Enjoyed reading this feature? You can find more like it inside Desktop magazine. Take a look at this month’s subscription special. This is really disappointing to see but may just kiss you for this well written and considered take on the whole issue. I’m reliably informed that the designs posted above are intentionally subversive—satirical design at work; a visual protest about this contest. Judging by the amount of tongue-in-cheek entries, it appears there’s a creative/social media backlash happening right now at the Creative Allies/Sydney Design contest website. Could be fun to see where this goes? Thanks Clinton, this has been a disturbing day for Sydney Design. What the PHM Contest has collected is an all new Sydney design aesthetic. Funny, ugly and sarcastic. 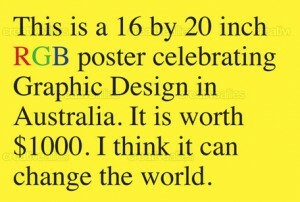 Bring forth the grand winning design champion of Sydney! Looks like someone in charge caught on — a large percentage of the submissions have now been pulled! Thanks for writing that Clinton and well said! 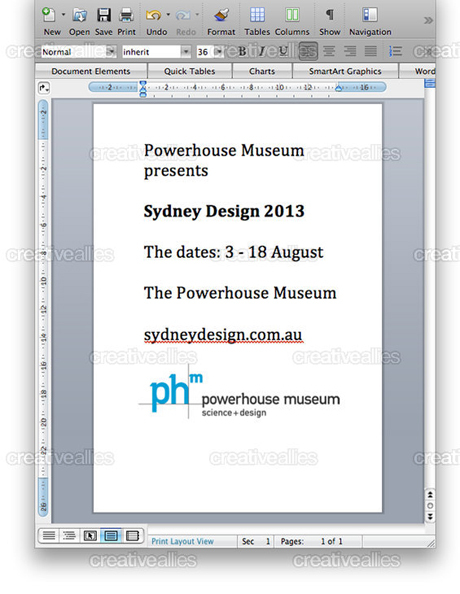 It’s a dark day for design in Sydney and demonstrates a shocking ignorance the PHM has for design. I really shouldn’t be surprised though given how truly rubbish the PHM experience is – no doubt the same idiots dealing with that are responsible. Crowd sourcing isn’t just about budget cuts, it’s about inexperienced or incapable people evading the decision making process. Shameful. Well said Clinton! It’s such a shame to see what is happening. You have spoken on behalf of many sydney siders. Thank you. They have now pulled the competition from the Creative Allies website. Let’s hope they are moving on from this stupid idea. Under the Australian ‘Special offers and competition’ law they are required to award the prize money they have advertised. The Power House Museum is behaving like a bunch of cowboys with no regard for the design industry, or professionalism of any sort. The creative community was set a brief. The brief evolved and became more than just a straight forward response. On an objective level there is a multitude of reasons and influences for this that I won’t speak of here because I wouldn’t never purport to speak for another designer. Although, to say that the repercussions of this and what it says about the community are entirely negative wouldn’t be correct. It showed me that design is fun. Design can instigate debate about interest/content vs. aesthetically pleasing visuals. The attitude and vigour to which I saw designers respond to this brief made me continually go back during the course of the day to check. It did not intend to detour other young budding designers to enter ‘serious’ pieces. As a medium visual communication is about choices. The use of ‘anti-design’ as a element and method of communication has spoken very loudly and was using a tool with a level of expertise. It communicated a message from those wanting to make their point of view known extremely well. Being inspired by the entries, a designer I work with entered. While entering he referred to it as a playground for Designers. Talking to each other through their medium. Isn’t that something to really take note of? That people had fun and spoke to each other. I saw people who were clearly great designers communicate yesterday extremely well. Although, they didn’t use beautifully crafted vectors or swiss type. Unfortunately for the Powerhouse it wasn’t what they were after but I don’t expect them to use any of those entries. Sitting here in my black shirt, black jeans and black shoes surrounded by beautifully crafted posters that inspire me everyday. I too am all for design as a serious communication and I’m sure someone will come through and design something beautiful and gorgeous that fits more into the look and feel that the festival deems suitable but it’s nice too know that sometimes I can be inspired by something without the need of beautifull crafted typography. The only thing I find sad or ‘disturbing’ would be that if we as a design community are so insecure and worried about this, that a feeling of censorship was needed around this competition or a need to not hero the pieces that I see on this page. Which I am still laughing at and finding clever in their own way. Using visual communication as a vehicle for creative thought, we now have something a lot more interesting. Something that has got a lot more column inches and has got us talking to each other when we would not otherwise we may not. Damn, they reconsidered their little crowdsourcing exercise!!!! Now what am I going to do with my adulatory homage to Comic Sans?!?!?! I left some comments on the Powerhouse’s and Desktop’s Facebook about this a few days ago. I was absolutely dumbfounded that other designers hadn’t reacted to this contest, crowd sourcing the design for a design festival! Glad to see this opinion was shared and the contest has been pulled, I can only hope that one of the many talented Sydney studios gets the brief – with a real budget. Not sure where this leaves Sydney Design. Well written Clinton. Wow, how is the greater society meant to respect the role of designers if we don’t even do it within our own community? It’s really interesting to see how this was responded to though. I wonder if all the entries are still up somewhere to see? You have struck the heart of the design community, and really ruffled up some feathers, and by doing so have brought to the surface some fantastically honest and subjective opinions. I’m not sure what the intention was on your part, PHM, but the results are a fascinating study in how designers think and feel on the atmosphere of their industry in the 21st century. These hilarious, satirist results should be kept for the public record, as there is a certain raw honesty in them that seems to question what the role of the designer is today. Still a difficult struggle against public perceptions.